Showing 1 - 20 of 1,013 results. 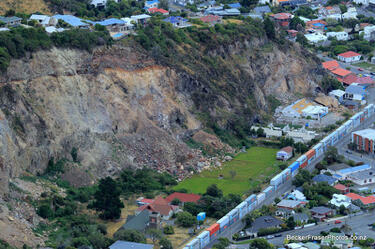 An aerial photograph captioned by BeckerFraserPhotos, "Western side of Sumner showing the container wall and rock fall on Wakefield Avenue". 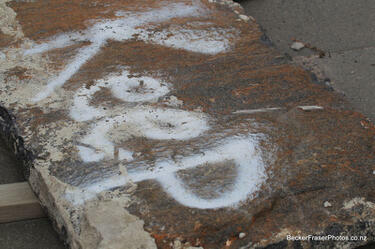 A photograph of the word "Keep" spray painted on a stone slab. A photograph of a damaged building. 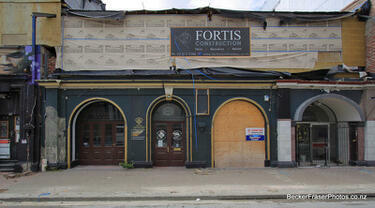 The photograph is captioned by BeckerFraserPhotos, "Sullivans, Manchester Street". 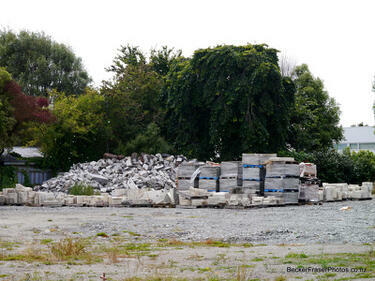 A photograph captioned by BeckerFraserPhotos, "Demolition of the Brannigans building. 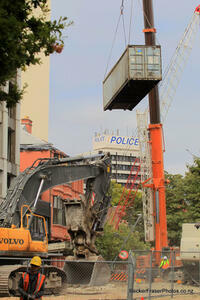 The container is being placed against the end of the building being demolished to protect the building below from falling debris". 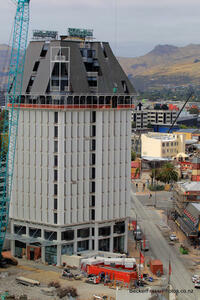 A photograph captioned by BeckerFraserPhotos, "The Holiday Inn hotel in High Street viewed from the top of the BNZ in Cathedral Square". 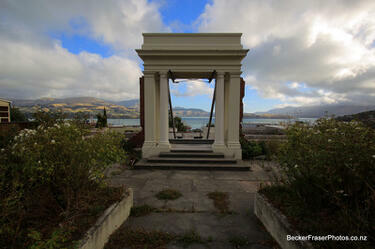 A photograph captioned by BeckerFraserPhotos, "The former convent on Exeter Street, Lyttelton". 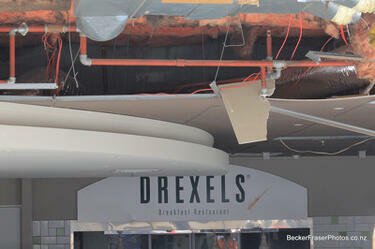 A photograph showing damage to the frontage of Drexels breakfast restaurant. 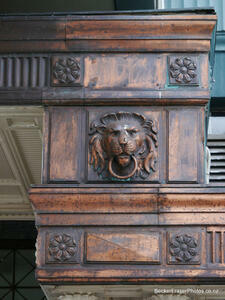 A photograph showing a relief of a lion's head on the copper trim at 690 Colombo Street. 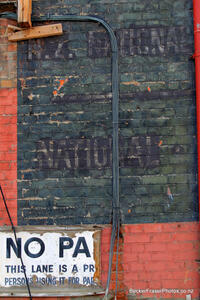 A photograph showing painted out sign with the words "N.Z. NATIONAL". A photograph of a house. 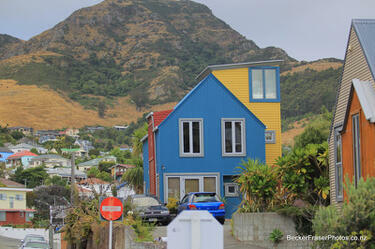 The photograph is captioned by BeckerFraserPhotos, "Coleridge Terrace, Lyttelton". 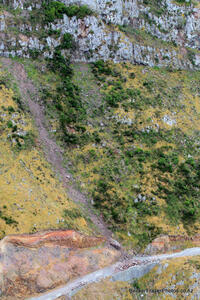 An aerial photograph captioned by BeckerFraserPhotos, "Evans Pass Road showing some of the rock falls". 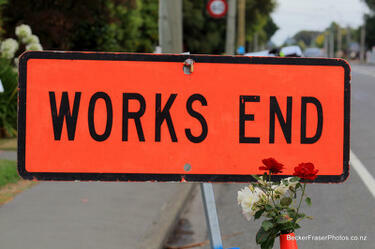 A photograph of flowers in a road cone. 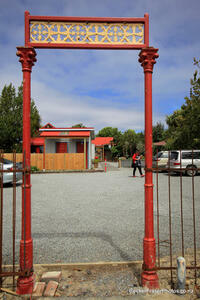 The photograph is captioned by BeckerFraserPhotos, "Halswell Junction Road". 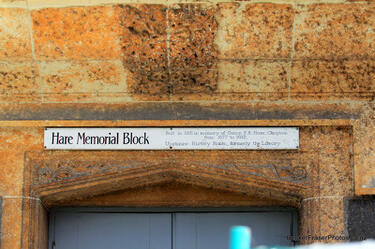 A photograph captioned by BeckerFraserPhotos, "Christ's College, Rolleston Avenue". 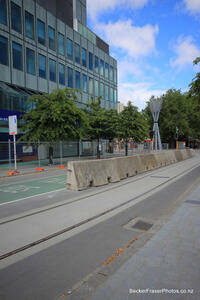 A photograph of concrete road barriers on Colombo Street. 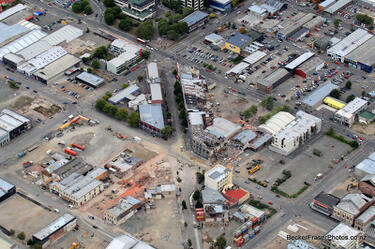 An aerial photograph captioned by BeckerFraserPhotos, "Looking south-east along High Street towards CPIT". 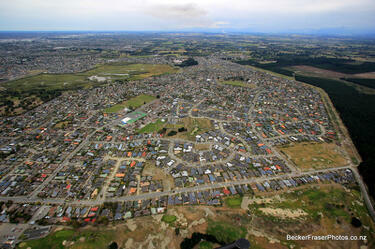 An aerial photograph captioned by BeckerFraserPhotos, "North New Brighton (Parklands) with Bower Avenue at the bottom". A photograph captioned by BeckerFraserPhotos, "Under the Red Verandah, Worcester Street, Linwood, has been rebuilt in another building on the site after extensive earthquake damage". 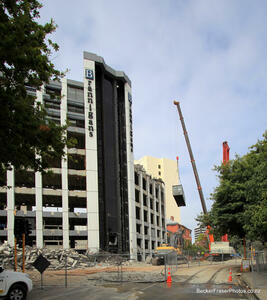 A photograph captioned by BeckerFraserPhotos, "Looking along Oxford Terrace with the demolition activity from the Brannigans building demolition in the foreground". A photograph captioned by BeckerFraserPhotos, "All that remains of St Lukes Church, on the corner of Kilmore and Manchester Streets". 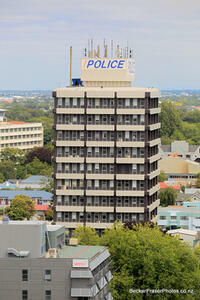 A photograph captioned by BeckerFraserPhotos, "The police station viewed from the top of the BNZ building in Cathedral Square".